Storage: Kept dry and cool arugula can last up to two weeks. Arugula cannot be frozen. Handling: Best used fresh, but you can keep arugula for a few days in the refrigerator. When ready to use, wash arugula, let it dry (use a colander or spinner to get rid of excess water). Place unused portion in a plastic bag and into the crisper drawer in the fridge with a paper towel to keep excess moisture to a minimum as well. An anti-inflammatory because it provides a truly unique combination of anti-inflammatory nutrients. Among these anti-inflammatory nutrients are saponins, including asparanin A, sarsasapogenin, protodioscin, and diosgenin. Alongside of these anti-inflammatory phytonutrients, asparagus provides a wide variety of antioxidant nutrients, including vitamin C, beta-carotene, vitamin E, and the minerals zinc, manganese, and selenium. In addition to the antioxidant nutrients above, this much-loved vegetable may also contain a valuable amount of the antioxidant glutathione (GSH). Storage: This hardy cold weather plant, can keep at home for more than a week when stored correctly. It likes to be standing up, put it in a tall container, with the cut ends on the bottom in an inch or so of water so the asparagus doesn’t dry out. Asparagus loves the cold, so tuck it in the chilliest corner of your refrigerator. Handling: Rinse your asparagus in cold water, dry with a paper towel and trim off the ends. How much to chop off? The asparagus will tell you—if you ask nicely. Hold one asparagus between your thumb and forefinger at the cut end. Grasp the bud end with your other hand and gently bend the stalk. It will snap exactly in the right place and shows you how much of the woody part to discard. No need to do this for the whole bunch, use your first hand-snapped asparagus as guidance to cut the rest of the woody stems. They are distinguished from the many differing varieties of beans primarily grown for their dried seeds in that green beans are harvested and consumed with their enclosing pods, typically before the seeds inside have fully matured. This practice is analogous to the harvesting of unripened snow pea pods or sugar snap peas of the pea family of plants. Popular green bean cultivars have been selected especially for the fleshiness, flavor, or sweetness of their pods. Storage: Best kept unwashed in a plastic bag and placed in the refrigerator crisper. Whole beans stored this way should keep for about seven days. Wash in cold water right before using. Trim and cut the ends off before eating. Handling: Wash beans thoroughly in clear, cool water. Beans can be cooked whole, cut crosswise or diagonally, or French-cut (i.e., cut along the length of the bean). If you want sweet tasting, crisp fresh beans, cut them as little as possible. 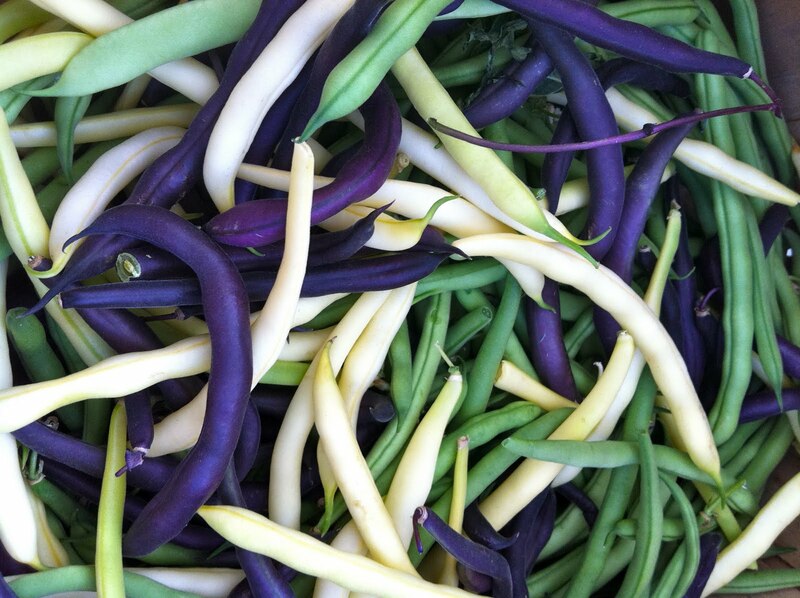 Cut older, more mature beans in the French style (i.e., lengthwise). Betanin and vulgaxanthin are betalains have gotten special attention in beet research. Beets are also an excellent source of folate and a very good source of manganese, potassium, and copper. They are also a good source of dietary fiber, magnesium, phosphorus, vitamin C, iron, and vitamin B6. Storage: If your beets still have greens attached, cut them off (don’t throw away! ), leaving an inch of stem. Keep these greens unwashed and refrigerated in a closed plastic bag if you plan on eating them later. Store the beet roots, with the rootlets (or “tails”) attached, unwashed, in a plastic bag in the crisper bin of your refrigerator. If you’re beet greens are a little sad and wilty, place beets root side down in a container with ice and cool water then cover greens with a bag and place in the fridge, they should come back to life within a day. They will keep for several weeks, but their sweetness diminishes with time; so try to use them within a week. Handling: Just before cooking, scrub beets well and remove any scraggly leaves and rootlets. If your recipe calls for raw beets, peel them with a knife or vegetable peeler, then grate or cut them according to your needs. Most often boiled or roasted. Broccoli can provide some special cholesterol-lowering benefits if you cook it by steaming. It has a strong, positive impact on our body’s detoxification system, and researchers have recently identified one of the key reasons for this detox benefit. 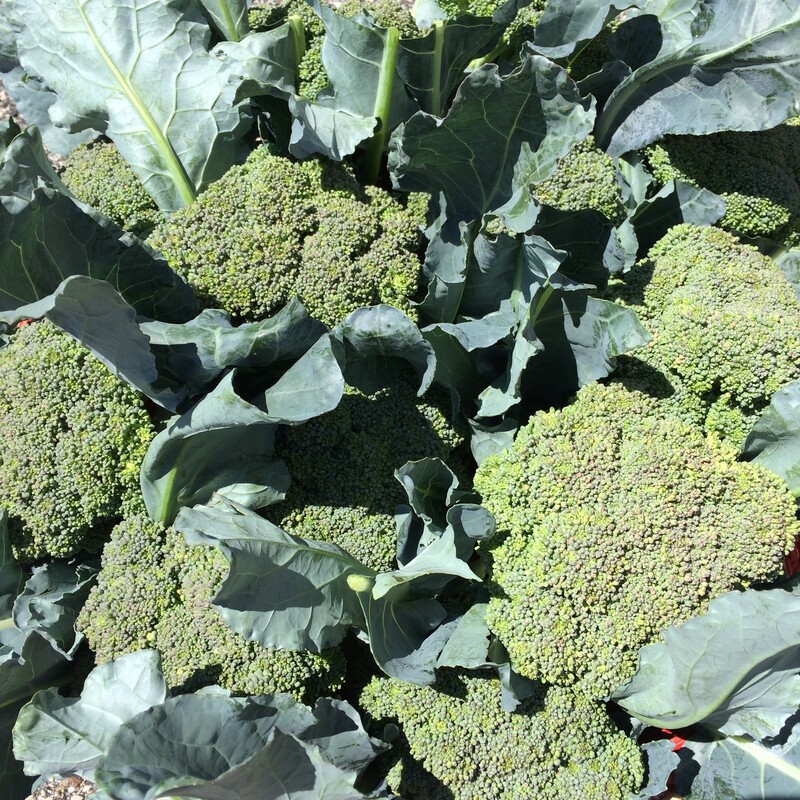 Glucoraphanin, gluconasturtiian, and glucobrassicin are 3 glucosinolate phytonutrients found in a special combination in broccoli. It may also help us solve our vitamin D deficiency epidemic. When large supplemental doses of vitamin D are needed to offset deficiency, ample supplies of vitamin K and vitamin A help keep our vitamin D metabolism in balance. Broccoli has an unusually strong combination of both vitamin A (in the form of beta-carotene) and vitamin K. For people faced with the need to rebuild vitamin D, broccoli may be an ideal food to include in the diet. Storage: Wrap broccoli loosely in a plastic bag and keep it in your refrigerator crisper. Don’t use an airtight bag, because broccoli continues to breathe after being harvested. It keeps for over a week but is firmest and tastiest if used within a few days. Handling: Broccoli in particular sometimes comes with innocuous friends tagging along in its depths. Immediately before cooking, soak your broccoli, head down, in cold, salted water (1 teaspoon salt to 8 cups of water) for 5 minutes. Any critters will float to the top. If you soak your broccoli in salt water and then store it, it will become too rubbery and wilted, so wait until the last minute to salt and soak it. Rich in many valuable nutrients. Brussels are an excellent source of vitamin C and vitamin K and are a very good source of numerous nutrients including folate, manganese, vitamin B6, dietary fiber, choline, copper, vitamin B1, potassium, phosphorus, and omega-3 fatty acids. Storage: Store sprouts unwashed in a closed plastic bag in the veggie bin. Their flavor is sweetest right after harvest, so try to use them within a few days. Handling: If they are still attached to the stalk, snap the sprouts off and remove any loose or discolored leaves. Trim the base of each sprout and cut a shallow X in the stem end to speed cooking. Rinse the sprouts in cool water. It can take a while to prepare Brussels sprouts, commonly roasted, so be sure to give yourself some extra time. Can provide you with some special cholesterol-lowering benefits if you cook it by steaming. The fiber-related components in cabbage do a better job of binding together with bile acids in your digestive tract when they’ve been steamed. When this binding process takes place, it’s easier for bile acids to be excreted, and the result is a lowering of your cholesterol levels. Raw cabbage still has cholesterol-lowering ability, just not as much as steamed cabbage. Cabbage in general—but also Savoy cabbage in particular—turns out to be an especially good source of sinigrin. Sinigrin is one of the cabbage glucosinolates that has received special attention in cancer prevention research. Storage: Cabbage is cleverly self-packaged. Just stick dry, unwashed cabbage in the refrigerator, preferably in the vegetable bin. The outer leaves may eventually get floppy or yellowish, but you can remove and discard them to reveal fresh inner leaves. Cabbage can keep for more than a month but will lose freshness rapidly once the head is chopped, so plan on using it within a day. If you only need half a head, place the remaining half in a plastic bag and shake a few drops of water onto the cut side. Close the bag and refrigerate. The cut half should last another few days if it was fresh when you cut it. Handling: Rinse the cabbage under cold running water just before use. You’ll need a big, sharp knife and plenty of elbow room. Peel away a few of the outer leaves, then cut the cabbage in half through the stem end. Lay it flat and quarter it, again through the stem end. Then balance each section upright and slice away the triangular core that is exposed at the base. From there you can chop, sliver, or grate the quarters. An excellent source of vitamin C, and a very good source of manganese, cauliflower provides us with two core conventional antioxidants. But its antioxidant support extends far beyond the conventional nutrients into the realm of phytonutrients. Beta-carotene, beta-cryptoxanthin, caffeic acid, cinnamic acid, ferulic acid, quercetin, rutin, and kaempferol are among cauliflower’s key antioxidant phytonutrients. This broad spectrum antioxidant support helps lower the risk of oxidative stress in our cells. Storage: Wrap dry, unwashed cauliflower loosely in plastic and store it in the refrigerator. It will keep for up to a week but will taste sweetest if used within a few days. Handling: Trim off the leaves and any brown spots caused by sun exposure. Rinse the cauliflower and cut out the cone shaped core at the base using a small paring knife. Stop there if you plan to cook it whole. Otherwise, proceed to break it into florets. You can also chop cauliflower rather than break it apart by hand. This method is much quicker, but the results will be more suitable for stew or curry than they will be for a vegetable platter. An excellent source of beta-carotene, containing a high amount of fiber. 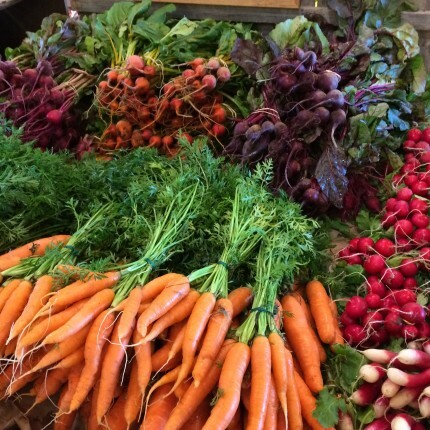 Beta carotene is important for eyesight, skin health, and normal growth. Carrots are also a good source of fiber, vitamin C and potassium, as well as vitamin B6, folate, and several minerals including calcium and magnesium. Storage: Remove the leafy green tops, leaving about an inch of stem. Refrigerate dry, unwashed carrots in a plastic bag for two weeks or longer. Handling: Peel carrots or scrub them well with a stiff brush just before using. Trim off any green spots, which can taste bitter. When slicing or chipping carrots for cooking, be sure to make all the pieces relatively the same size. With their tapered shape this can be a challenge, but your efforts will ensure an evenly cooked dish. Chard leaves contain at least 13 different polyphenol antioxidants, including kaempferol, the cardioprotective flavonoid that’s also found in broccoli, kale, strawberries, and other foods. But alongside of kaempferol, one of the primary flavonoids found in the leaves of chard is a flavonoid called syringic acid. Syringic acid has received special attention in recent research due to its blood sugar regulating properties. This flavonoid has been shown to inhibit activity of an enzyme called alpha-glucosidase. When this enzyme gets inhibited, fewer carbs are broken down into simple sugars and blood sugar is able to stay more steady. It makes sense to think about chard as a vegetable whose flavonoid phytonutrients are unique and may offer special benefits for blood sugar control. In the reddish-purple stems of chard and the reddish-purple veins in the leaves, scientists have identified at least 9 betacyanin pigments, including betanin, isobetanin, betanidin, and isobetanidin. In the yellowish stems and veins, at least 19 betaxanthin pigments have been identified, including histamine-betaxanthin, alanine-betaxanthin, tyramine-betaxanthin, and 3-methoxytyramine-betaxanthin. Many of the betalain pigments in chard have been shown to provide antioxidant, anti-inflammatory, and detoxification support. Storage: Do not wash chard before storing as the exposure to water encourages spoilage. Place in a plastic storage bag and wrap tightly around the chard, squeezing out as much air as possible. Place in the fridge where it will keep fresh for up to 5 days. If your Chard looks sad and wilty make a fresh cut at the stem, place in an inch of water in a vase or jar and cover with a bag tightly and they will bounce right back, good as new! Handling: Rinse well under cold running water. Do not soak, as it may result in the loss of water-soluble nutrients. Contains fiber, protein, vitamin C, thiamin, riboflavin, niacin, magnesium and phosphorous. Fun fact: there is one silk for every kernel of corn, on average there are 800 kernels in 16 rows on each ear of corn. Here at Applecrest we grow about 5 acres of corn, which at the height of the season will remove about 40 tons of carbon dioxide from the air, talk about goin’ green! Storage: Corn can be stored in its husk up to four days in the refrigerator but it will be at its sweetest when fresh picked. Fresh corn can also be frozen! Boil your ears of corn for 4-6 minutes, cool in an ice bath, cut kernels off the cob, store in air tight container (bag or tupperware works), and stick in freezer. Cucumbers are an excellent source of vitamin K and molybdenum and a very good source of the pantothenic acid. They are also a good source of copper, potassium, manganese, vitamin C, phosphorus, magnesium, biotin, and vitamin B1, also containing the important nail and health-promoting mineral silica. Storage: Most supermarket cucumbers are usually waxed to keep them from drying out during the trip from wherever they were grown. Our cucumbers will dehydrate faster than a waxy cucumber so be sure to get them into the refrigerator right away. If you store unwashed cucumbers in a sealed plastic bag in the vegetable crisper bin, they’ll hold for at least a week. Cucumbers store best at around 45 degrees F, but refrigerators are usually set cooler than this. Keep cucumbers tucked far away from tomatoes, apples, and citrus fruits, as these give off ethylene gas that accelerates cucumber deterioration. Handling: You can do a lot of fancy things to the skin of a cucumber, and when it is young, fresh, and unwaxed, it really only needs to be thoroughly washed. If the skin seems bitter you can remove it; if they seeds are bulky, slice the cucumber lengthwise and scoop them out. Scoring the skin of a cucumber with a fork or citrus zester gives it attractive stripes and may help release any bitterness. Slice, dice, or cut a cucumber into chunks according to specifications given in your recipe. 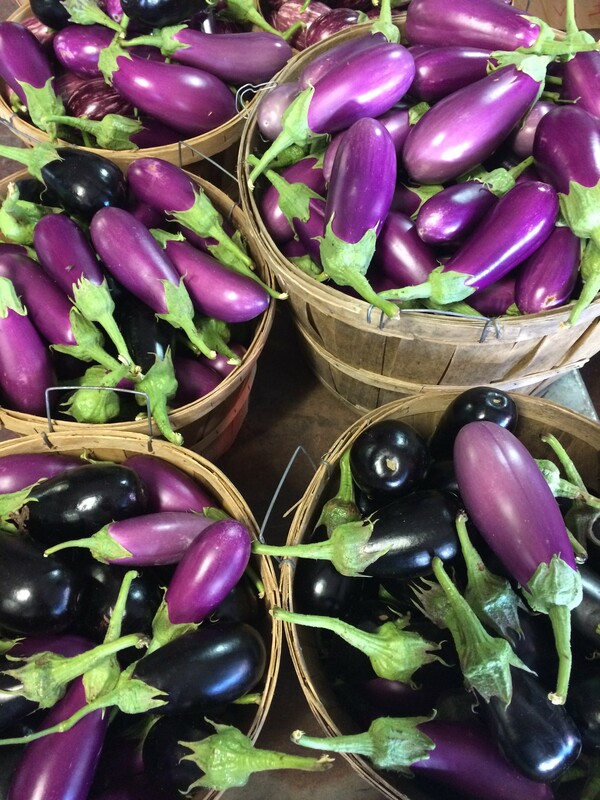 Storage: Eggplant prefers to be kept at about 50 degrees F, which is warmer than most refrigerators and cooler than most kitchen counters. Wrap unwashed eggplant in a towel (not in plastic) to absorb any moisture and keep it in the vegetable bin of your refrigerator. Used within a week, it should still be fresh and mild. Handling: Rinse eggplant in cool water and cut off the stem. Many people like to peel, salt, and drain their eggplant to draw out any bitter flavor; however, bitterness develops only in eggplant that has been stored for a while, so with farm fresh specimens this is generally not necessary. Though many recipes call for salting in order to make the vegetable less watery and more absorbent– much like draining tofu. Storage: Garlic scapes keep well in cold storage, although fresh ones taste the best. Scapes can be kept in the refrigerator for a month or longer, in a paper bag. Scapes can also be frozen but they tend to lose some of their garlicky heat. Handling: Before using scapes rinse under cold water. Trim the un-popped flower bulb off before eating and enjoy the rest of the vegetable. Allicin—one of garlic’s most highly valued sulfur compounds—stays intact for only 2-16 hours at room temperature when it is present in purified (extracted) form. But when it’s still inside of crushed garlic, allicin will stay viable for 2-1/2 days. Garlic may help improve your iron metabolism because the diallyl sulfides in garlic can help increase production of a protein called ferroportin. Ferroportin is a protein that runs across the cell membrane forming a passageway that allows stored iron to leave the cells and become available where it is needed. In addition to being a good source of selenium, garlic may be a more reliable source as well. Garlic is what scientists call a “seleniferous” plant: it can uptake selenium from the soil even when soil concentrations do not favor this uptake. Storage: Like onions, garlic can be eaten fresh or dried. Dried garlic will keep for several months in a dark, dry, well-ventilated place at a cool room temperature. Fresh green garlic must be kept in a plastic bag in the refrigerator and should be used quickly, any accumulated moisture in the bag will cause it to spoil. Handling: To separate the cloves, set the bulb, root end up, on a counter and press down on it with your palm. To peel an individual clove, trim off the root end and then press on the clove with the flat side of a knife. The skin should pop off nicely. If garlic is fresh-uncured-the skin will present more of a challenge. A single cup of raw kale contains Vitamins A, K, C, B6, B1, Thiamin, B2, B3 Manganese, Calcium, Copper, Potassium, Magnesium, Iron, and Phosphorus. Boiling kale diminishes the nutrients but it is one of the most nutrient dense foods in existence. Storage: Washing it before storing will only increase spoilage. Store kale in the coldest part of the fridge, it tends to get more bitter the longer it is left at room temperature. Place kale bunch in a mason jar or small vase with a little ice and cool water and then a plastic bag over the greens and place in the fridge and it will hold up quite nicely. Or you can wrap kale in a paper towel and then place it in an air-tight bag. Handling: You only want to cut it and wash it prior to use. It is also sensitive to other produce, and is very sensitive to ethylene, formed naturally from certain other produce, so store it away from: Apples, Apricots, Avocados, Bananas, Cantaloupe, Figs, Honeydew, Nectarines, Peaches, Pears, Plums, and Tomatoes. A fresh kohlrabi stem is a rich source of vitamin-C; provides 62 mg per 100 g weight that is about 102% of RDA. Vitamin C (ascorbic acid) is a water-soluble vitamin and powerful anti-oxidant. It helps the human body maintain healthy connective tissue, teeth, and gum. Its anti-oxidant property helps the human body protect from diseases and cancers by scavenging harmful free radicals from the body. It especially contains good amounts of many B-complex groups of vitamins such as niacin, vitamin B-6 (pyridoxine), thiamin, pantothenic acid, etc., that acts as co-factors to enzymes during various metabolism inside the body. Storage: If you plan to use it soon, wrap the whole unwashed kohlrabi-stem, stalks, and leaves-in a plastic bag and keep it in the refrigerator. Otherwise, remove the stalks and greens from the bulb and use them within a week. Store the bulb in another plastic bag in the fridge and use it within two weeks. Handling: Rinse kohlrabi under cold running water just before use. Unless the skin seems particularly tough, kohlrabi does not have to be peeled. Just trim off the remains of the stalks and root. Grate, slice, or chop kohlrabi as desired. Storage: Loosely wrap unwashed leeks in a plastic bag and store them in the vegetable bin of your refrigerator. They will keep for at least a week. Handling: The edible portions of the leek are the white base of the leaves (above the roots and stem base), the light green parts, and to a lesser extent the dark green parts of the leaves. Cut the leek about 1 inch above the white part, where the leaves begin changing from dark to light green. (Save the unused greens; they’ll give great flavor to your next vegetable stock.) Slit the leek lengthwise and soak it in lukewarm water for up to 15 minutes. Fan the leaves under running water to dislodge any dirt collected there, then pat thoroughly dry. You can julienne a leek by cutting it lengthwise, or slice it crosswise. If you want to clean a leek that you will be cooking whole, make a slit down one side to within an inch or two of the root end. Then spread the leaves under running lukewarm water to clean the leek. During cooking the leeks will stay whole. When serving, arrange the leek with the cut side down. A melon is of any various plants of the family Cucurbitaceae with edible, fleshy fruit. The word “melon” can refer to either the plant or specifically to the fruit. Many different cultivars have been produced, particularly of muskmelons. Watermelons, cantaloupe, and honeydew melon are the most popular varieties of melons in the United States because they are exposed to pests and microorganisms from dirt, it is very important to apply the best food safety practices before enjoying them. Storage: Melons can keep up to a week, whole and uncut, into your fridge. If your melon has been sitting in your car and its a hot day, let it cool off before sticking it right into the fridge, as the drastic temperature change will cause the fruit to spoil faster. Handling: Wash your melons! You may not think it is important to wash the outside of a melon since you do not eat the tough outer part, but when you slice the melon, bacteria on the outside of the melon are easily transferred to the inner edible area that you eat. Be sure to wash the outer surface of melons as described below. Wash your hands thoroughly with warm, soapy water before and after. Wash the outer surface of the melon thoroughly with cool tap water to remove surface dirt. Scrub the melon with a clean produce brush. Dry the melon with a clean cloth or paper towel and refrigerate until ready to cut. Storage: White (sweet mild onions) should be kept in a plastic bag in the refrigerator, but beware the fatal moisture accumulation that causes them to spoil. Eat them within a week or two. Red onions will keep in any cool, dark, dry place with adequate air circulation for several months if they have been cured. Uncured storage onions should be stored like sweet mild onions. Be sure to store onions and potatoes in separate places as moisture given off by potatoes can cause onions to spoil. Handling: When the sulfur in cut onions meets the water in your eyes, it turns into sulfuric acid, which causes the infamous onion-induced tears. To reduce the sulfur assault, use a very sharp knife, or chill your onions before cutting them. If you’re planning to use chopped or sliced onions raw, it’s a good idea to rinse them in water before use, as this takes away the unpleasant bite. Cutting boards can retain the flavor of onions so it’s a good idea to reserve a separate cutting board for onions, scallions, leeks, and garlic. Cultivated peaches are divided into clingstones or freestones depending on whether the flesh sticks to the stone or not; both can have either white or yellow flesh. Peaches with white flesh typically are very sweet with little acidity, while yellow-fleshed peaches typically have an acidic tang coupled with sweetness, though this also varies greatly. Both colors often have some red on their skin. Low-acid white-fleshed peaches are the most popular kinds in China, Japan, and neighbouring Asian countries, while Europeans and North Americans have historically favoured the acidic, yellow-fleshed cultivars. Storage: Peaches bruise easily, so when testing for ripeness use your whole hand, not just one finger. Leave peaches out, on the counter, especially if still hard. If they need to ripen even more, place in a closed paper bag and leave on the counter like you would avocados. Once ripe, store in the crisper bin of your refrigerator where they’ll keep for up to five days. Handling: Eat these guys fresh, rinsed and wiped to remove fuzz. Peaches can also be frozen. Peel and slice them, lay them on a baking tray and stick in the freezer for a few hours until they’re frozen through. Transfer the peach wedges to a resealable plastic bag and freeze until ready to use. They’ll keep at least 6 months (longer in a free-standing freezer) and are perfect to use in baking. This nitrogen fixing, soil-loving veggie provides benefits to all aspects of its’ life. Chock full of antioxidants and phytonutrients, this colorful, versatile, interactive vegetable is a sure family favorite. Storage: English Peas don’t have much of a shelf life, so we don’t recommend storing them —in their pods or shelled—for very long. Store pods in a plastic bag in the crisper drawer of the refrigerator and use them within a couple of days. Once they’re shelled, the best way to store peas is to freeze them. First blanch them for a minute or two in boiling salted water and then shock them in an ice-water bath until cool (this helps to maintain their bright color). Drain and freeze them in zip-top bags and they will keep for five to six months. Handling: Fresh shell peas may seem a bit tedious but its easy and worth every second. Remove the stem of the pod, peel the stringy fiber from the seam, pry the pod open and run your thumb along the interior to detach the peas. Pour into a bowl, and continue on to the next pod. Snap peas are also known as sugar snap peas, and are a cross between snow peas and garden peas. The whole pod is eaten and has a crunchy texture and very sweet flavor, raw or cooked. They are high in vitamins and a reliable source of fiber, rich in antioxidants, but storage methods and duration can change the antioxidant content in the peas. When sugar snap peas are stored at room temperature the antioxidant activity in the seeds is diminished, but the antioxidant activity in the pods double. Overall, the total antioxidant levels decrease with prolonged storage. Buy fresh and use them promptly to get the maximum antioxidant benefit from them. A 3-ounce serving of raw sugar snap peas provides 50 milligrams of vitamin C, more than half the recommended daily intake for that antioxidant nutrient. It is also a rich source of some B-complex vitamins, giving you nearly half the niacin and one-tenth of the folate you need each day, boosting your intake of these nutrients that help your body convert food to energy. They give you one-fifth of the vitamin K you need, ensuring that your blood clots properly and supporting your bone health. Boiled sugar snap peas have 40 milligrams of vitamin C and about the same amount of niacin, folate and vitamin K as raw sugar snap peas. Storage: We recommend eating them right away, but they will stand to be refrigerated in a plastic bag for up to 4 days. Handling: These are great raw or cooked, many people like to use them in a stir fry since they don’t take long at all to cook. They are flat with very small peas inside and the whole pod is edible although the tough “strings” along the edges are usually removed before eating. Storage: Store whole peppers in a cool, dry place or refrigerate 3-4 days in a plastic bag. Always refrigerate cut peppers. Hot peppers should be treated equally when storing them, although care should be taken when handling. Handling: For jalapenos, the heat giving component capsaicin, found in the pithy, the seed-studded flesh or placenta is located near the stem and extends along the inner ribs. Cut pepper open and scrape this part off with a spoon to reduce some of the heat & pungency. Be sure not to touch your face and wash your hands thoroughly when finished! Scientifically speaking, pumpkins are a fruit (they contain seeds) but when it comes to cooking, they are often referred to as vegetables. Pumpkins are low in calories but high in fiber and low in sodium. The seeds are high in protein, iron, and the B vitamins. Pumpkins are very high in beta-carotene. Storage: Store your pumpkin in a dry, well-ventilated area. Before use, wash your pumpkin in hot soapy water to remove any soil residue. Handling: Pumpkins can be baked, steamed, stir-fried, or boiled. Pumpkin is great for soups, pies and roasts. You can also freeze your pumpkin! The easiest way to freeze pumpkin for later use is to preserve cooked pumpkin that is mashed. First wash the pumpkin then cut in half to remove seeds. Bake pumpkin in the oven then remove pulp from rind and mash. From here you can place the mash in plastic bags and freeze. 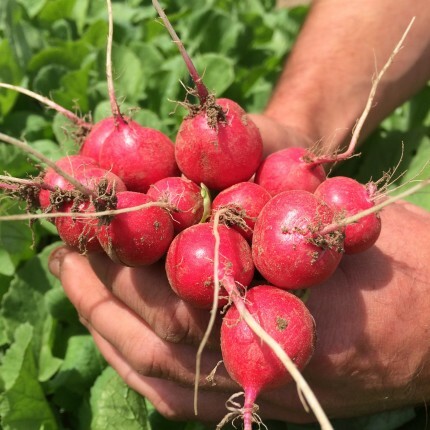 Radishes are a naturally cooling food and their pungent flavor is highly regarded in eastern medicine for the ability to decrease excess heat in the body that can build up during the warmer months. They are a natural cleansing agent for the digestive system, helping to break down and eliminate stagnant food and toxins built up over time. Regular consumption of radishes can help prevent viral infections, because of their high vitamin C content and natural cleansing effects. Storage: You can eat the greens! Remove radish leaves and store the (unwashed) greens in a loosely wrapped plastic bag to eat later. Because of their high water content, radishes deteriorate quickly. Store them dry and unwashed in a plastic bag in the refrigerator. Most radishes should keep for a week, while black radishes will keep slightly longer. Handling: Scrub them well to remove any lingering dirt, using a veggies brush helps. Trim off the stems and rootlets. Slice, chop, or mince the roots or leave them whole. Can be eaten raw or cooked. Raspberries are an excellent source of vitamin C, manganese, and dietary fiber. They are a very good source of copper and a good source of vitamin K, pantothenic acid, biotin, vitamin E, magnesium, folate, omega-3 fatty acids, and potassium. Storage: Store at 31-32 degrees in the fridge, but not in the crisper. They should last for three to five days depending on ripeness. Handling: Do not to wash unless absolutely necessary and not until your ready to eat them! Preserves are best prepared with freshly picked raspberries. They can be frozen too! Make a single layer on a cookie sheet so they can freeze without sticking together. Once frozen, place into airtight bags. Rhubarb contains potassium, vitamin C, and dietary fiber. It is a herbaceous perennial growing from short, thick rhizomes. It produces large poisonous leaves that are somewhat triangular, with long fleshy edible stalks and small flowers grouped in large compound leafy greenish-white to rose-red inflorenscences. Storage: First, cut off and throw away the leaves. Never eat rhubarb leaves, they are toxic! Place stalks in a plastic bag to retain moisture and place in the fridge’s crisper drawer, where it will keep for usually about a week. They can also be frozen… to do this cut stalks in to 1 inch chunks and place in an airtight plastic bag. Rhubarb will keep for up to a year in the freezer. Handling: Rhubarb is rarely eaten raw. To prepare, first remove all the leaves, rinse and pat dry. Trim the ends and cut into 1-inch chunks. If it is stringy, just remove the tough strings as you would with celery. However, the strings will usually break down during the cooking process. Stew or bake with a little water and plenty of sugar to combat the tartness. Rhubarb can quickly cook down into a syrupy liquid, so keep an eye on it if you need it to retain some texture for specific recipes. Generally, the redder the stalk, the less sweetener is needed. Mesclun is a salad mix of assorted small, young salad green leaves, which originated in Provence, France. The traditional mix usually includes chervil, arugula, leafy lettuces and endive, while the term may also refer to an undetermined mix of fresh and available baby salad greens, which may include lettuces, spinach, arugula (rocket or roquette), Swiss Chard (silver beet), mustard, endive, dandelioin, frisee, mizuna, mache (lamb’s lettuce), radicchio, or sorrel. Storage: Store unwashed lettuce or mesclun in a plastic bag in the refrigerator. To store lettuce or greens that you have already washed and dried, roll the leaves loosely in a kitchen towel, put the towel in a plastic bag and place the package in the vegetable crisper bin. Wet greens will spoil quickly, so make sure they are truly dry before refrigerating them. If you have a salad spinner, wash and spin the greens before refrigerating them and use within three or four days. Handling: Salad greens bruise easily, so be sure to handle them gently. For lettuce, slice the head at its base with a sharp knife and let the leaves fall open. Discard any damaged or leathery outer leaves and tear large leaves into bite sized pieces. Both lettuce and mesclun mix can be washed by swishing them around in a basin of cold water. If a lot of dirt collects in the water, wash them a second time. Best to rry the greens in a salad spinner for best results. Scallion, green onion, and spring onion are English names (with many other regional names throughout the world) for various Allium species. All of the Allium have hollow green leaves (like the common onion), but these are used while they lack a fully developed root bulb. Scallions are very low in calories; 100 g of fresh leaves provide just 31 calories. They contain many noteworthy flavonoid anti-oxidants, plant fiber, minerals, and vitamins that have proven health benefits. Being a leafy-green, scallions naturally carry more plant-derived antioxidants, and dietary fiber than their fellow bulb (allium) members like onions, shallots, etc. 100 g fresh spring onions provide 2.6 g or 7% of daily-recommended levels of fiber. Storage: Store in a vase or jar filled with an inch or two of water. Stand scallions in jar and cover with a plastic bag and place in fridge. Lasts about a week. Handling: To prepare, trim off roots and peel off 1-2 layers of outer thick leaves until you find an ice-white inner stalk. Wash the whole scallion in a bowl of cold water. Mop dry. Chop the leaves closely using paring knife in a way you desire like rings, sticks, diagonals…etc. Generally, spring onions are used in recipes whenever you want subtle flavor of onions but at the same time want to avoid strong pungent flavor of onions. Besides, they also add bright green color to the recipes. Recent research has shown that spinach leaves that look fully alive and vital have greater concentrations of vitamin C than spinach leaves that are pale in color. The greater supply of vitamin C helps protect all of the oxygen-sensitive phytonutrients in the spinach leaves and makes them looking vibrant and alive. Dark leafy greens like spinach are important for skin and hair, bone health, providing protein, iron, vitamins, and minerals. The possible health benefits of consuming spinach includes improving blood glucose control in diabetics, lowering the risk of cancer, lowering blood pressure, improving bone health, lowering the risk of developing asthma and more. Storage: Fresh spinach should be stored loosely packed in a sealed plastic bag in the refrigerator crisper, where it will keep for about four days. Do not wash before storing, as the moisture will cause it to spoil. Cooked spinach does not store too well, certainly no longer than one day in the refrigerator. Handling: Fill a bowl with cool water and let the spinach soak, this allows all the dirt to settle to the bottom of the bowl, repeat if necessary. You can eat raw, cooked, sauteed, or add to soups and stews in the last few minutes of cooking. The strawberry, a member of the rose family, is the only fruit with seeds on the outside. Strawberries are the first fruit to ripen in the spring. Eight strawberries will provide 140 percent of the recommended daily intake of Vitamin C for kids. One cup of fresh strawberries provides about 88 milligrams of ascorbic acid, which more than meets the recommended daily dietary allowance of 45 milligrams for the average adult. Vitamin C is well retained when the strawberries are handled carefully. Capping, injuring, cutting, or juicing, however, will reduce the vitamin content. Locally grown strawberries are much sweeter and juicier than their-bred for shipping-counterparts. Storage: Use your strawberries as soon as possible, because they stop ripening as soon as they’re picked. 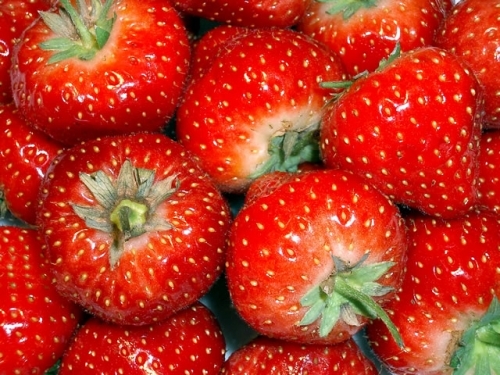 Don’t wash your strawberries until you’re ready to use them, as moisture causes them to spoil more quickly. Leave the caps on and store your strawberries in an uncovered container in the fridge. Take them out of the fridge about an hour before you’re ready to use them, as they are best at room temp. Handling: Gently rinse your berries and then pat them dry with a towel. Remove the caps with a paring knife or just a slight twist of the wrist, and they will be ready to eat or for use in all types of strawberry recipes. Summer squashes, members of the Cucurbitaceae family and relatives of both the melon and the cucumber, come in many different varieties. While each variety may have a distinct shape, color, size and flavor, all varieties share some common characteristics. Regardless of variety, all parts of summer squash are edible, including the flesh, seeds and skin. Some varieties of squash also produce edible flowers. Unlike winter squash, summer squash are more fragile and cannot be stored for long periods of time unless frozen. For Native Americans, squashes were considered as one of the “three sisters” along with corn (maize) and beans. Storage: Un-waxed farm-fresh zucchini and summer squash respire through their skins, so they need to be refrigerated as soon as possible. Store them unwashed in a perforated plastic bag in the vegetable bin or refrigerate them in a sealed plastic container that you’ve lined with a kitchen towel. In the refrigerator they keep for about a week and a half. Handling: Handle zucchini with care as they are easily damaged. Rinse under cool running water to remove any dirt or prickles; then slice off the stem and blossom ends. According to the specifications of your recipe, slice the vegetable into rounds, quarters, or chunks. Tomatoes are the richest source of lycopene which is important for the health of the prostate gland in men. They were first brought to Europe in the mid 1500’s. They are a treasure of riches when it comes to their antioxidant benefits. 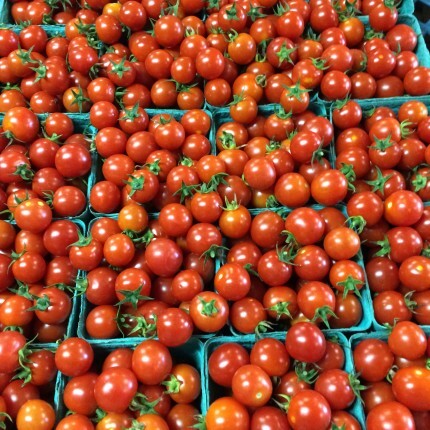 In terms of conventional antioxidants, tomatoes provide an excellent amount of vitamin C and beta-carotene; a very good amount of the mineral manganese; and a good amount of vitamin E. In terms of phytonutrients, tomatoes are basically off the charts! Storage: Wash and dry your tomatoes before storing. Unless you’re planning to store your tomatoes for over a week, a windowsill, counter-top or bowl, stem side down, works fine. If you know you won’t use them in the next few days, then lower temperatures will help to preserve the fruit. Contrary to our common practice in the US, storing in a refrigerator is not otherwise recommended, as the cooler temperatures can reduce flavor, causing mushiness and mealyness. Handling: Tomatoes bruise easily, so handle them with care. Your fresh-picked tomatoes will last longer on the kitchen counter than store-bought ones anyway, which are probably a few days old when you get them. To hasten the ripening process, place them in a paper bag with a banana or apple since the ethylene gas that these fruits emit will help speed up the tomato’s maturation. 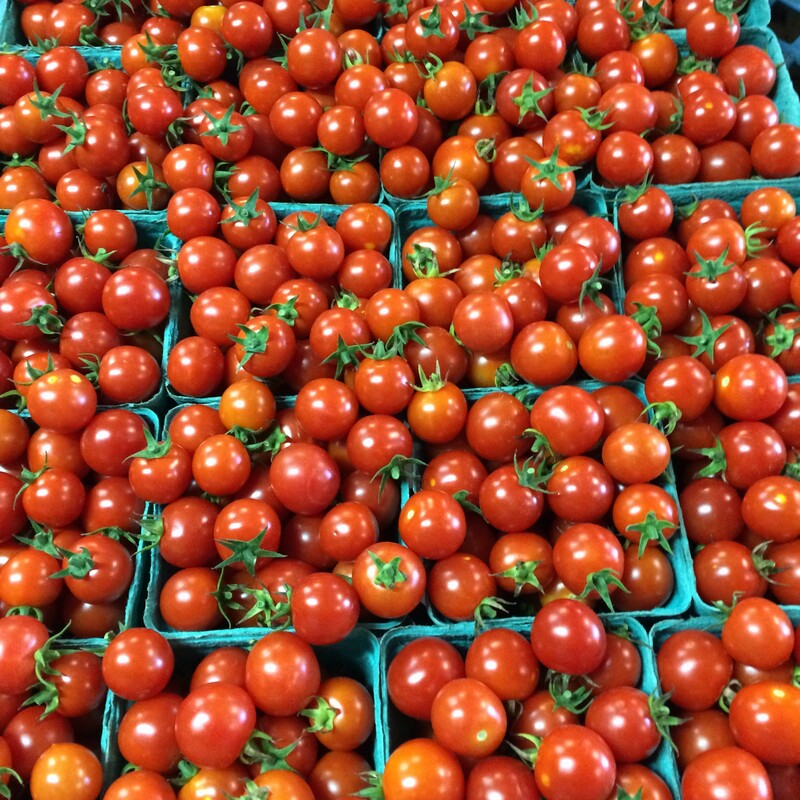 If the tomatoes begin to become overripe, but you are not yet ready to eat them, place them in the refrigerator (if possible, in the butter compartment which is a warmer area), where they will keep for one or two more days. Removing them from the refrigerator about 30 minutes before using will help them to regain their maximum flavor and juiciness. The turnip (Brassica rapa subsp. rapa) is a root vegetable commonly grown in temperate climates worldwide for its white, bulbous taproot. 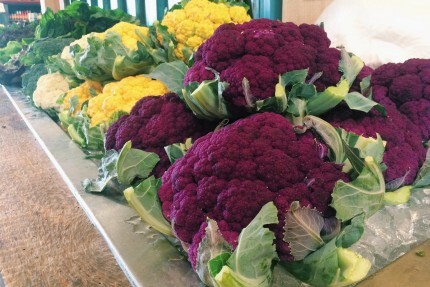 As a member of the cruciferous family it provides a healthy dose of vitamin C and most of the B complex vitamins. Turnip greens provide a days worth of vitamin A and K, so don’t throw them on the compost heap! Add them to your veggie saute or boil as you would spinach. Storage: If your turnip greens have their roots attached, remove them from the root. Store root and greens in separate plastic bags, removing as much of the air from the bags as possible. Place in refrigerator where the greens should keep fresh for about 4 days. Handling: Rinse turnip greens under cold running water. Chop greens into 1/2-inch slices for quick and even cooking. To get the most health benefits from turnip greens, we recommend letting them sit for a minimum of 5 minutes before cooking. Sprinkling with lemon juice before letting them sit may be able to help activate their myrosinase enzymes and increase formation of beneficial isothiocyanates in the greens. Turnips are available all year long, but are at their best in fall when mature specimens are fresh. In spring they are small and sweet. Larger turnips necessarily develop tougher skins and a stronger flavor, but are great for mashing and or adding to soups and stews. Like most root vegetables, turnips are a great storage vegetable to use when you want to keep eating locally throughout the winter. Winter squashes have a hard skin and flesh (this includes acorn, buttercup, butternut, calabaza, delicate, Hubbard, spaghetti, sweet dumpling, and Turban). The unique carotenoid content of the winter squash is not their only claim to fame in the antioxidant department. There is a very good amount of vitamin C in winter squash (about one-third of the Daily Value in every cup) and a very good amount of the antioxidant mineral manganese as well. Recent research has shown that the cell wall polysaccharides found in winter squash also possess antioxidant properties, as do some of their phenolic phytonutrients. Storage: Squash store best at an even 50°F in a dark place. Store in a cool and dry dark place with good ventilation. Butternut and acorn can keep up to a month or more. Once squash has been cut, you can store them wrapped in a piece of plastic in the fridge for five to seven days. They also store well in a warmer section of the root cellar such as on the top shelf. Handling: Be slow and cautious and use a stable working surface when cutting the squash. If you need cut unpeeled chunks for a recipe, for every squash except Butternut it is easier to use the pre-baking method: first pierce squash to allow heat to escape while in the oven, bake whole squash at 350° F until barely tender to the poke of the finger, about 20-30 minutes. This softens the shell, so cutting and peeling is much easier.